Did you find us on Houzz yet? Houzz is a great place to find inspiring ideas for the home. You can also find professionals in your area for contracting, interior design, architects, landscaping and more. See a product you like? Many times the product can be sourced. Check out our profile here. Does your bed have any personality? Need 11 reasons to fall in love with wall to wall carpeting again? Posted in General on February 19, 2014 by socialmediamanager. Hello Everybody! I'm here to talk to you about a question that gets asked a lot around here. What is the difference between curtains and draperies? Is there a difference? Well I've got the answer for you! Some of us might use the terms interchangeably but there is a difference. Curtains are a lighter fabric that are thin or sheer. They have no lining and therefore do not block out any sunlight and the thin fabric doesn't provide privacy. But, They do come in a nice range of colors and patterns and are usually cost friendly. Draperies are made of a heavier fabric and are typically lined. Draperies not only block out the light but they also provide insulation to block out heat and cold, they also provide privacy. Depending on your style they can look beautiful and casual or they can be as elegant as you can image. Sew Fine offers everything you can imagine when it comes to sheers and draperies. We love what we do and we're great at what we do. If you are just moving into a new home or want to redecorate call us and we can help you with window treatments! Posted in General on January 20, 2014 by socialmediamanager. We care about our clients and are proud to offer child safe products designed for your home. Hunter Douglas offers child-friendly LiteRise® cordless lifting systems on their window coverings. 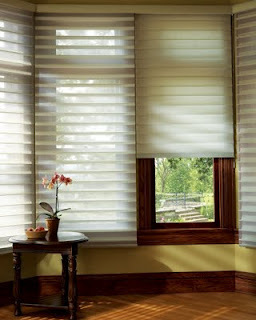 The LiteRise® cordless system makes raising and lowering blinds and shades easier than ever. Simply push up to raise and pull down to lower. Your blinds and shades stay right where you put them. No lift cords for a clean, uncluttered look. Proprietary design holds blinds and shades securely in any position - no constant adjusting, making it easy to raise your blinds or shades to an even height. Elimination of lift cords means increased safety for children and pets. Top-Down/Bottom-Up and Duolite™ options are available on Duette® and Applause® with LiteRise, a great solution for bedrooms and bathrooms, even media rooms where both light control and privacy are required. That's why we have a special offer for October's child safety month...and because we care about our clients it runs from September 14- November 4, 2013. Call us today to schedule an in-home consultation with us and receive FREE LiteRise® cordless system with the purchase of Silhouette Window Shadings, Vignette Modern Roman Shades, and Duette Honeycomb Shades. Posted in General on September 16, 2013 by socialmediamanager. Need something new on your windows? Available in 15 fabrics and 102 stunning fabric and color combinations, Vignette® Modern Roman Shades offer fresh, contemporary styling for almost any window. Vignette shades roll, stack and traverse with no exposed rear cords for enhanced child safety. All options are created from the same fabrics for ultimate coordination. Operating systems include: Ultraglide retractable cord system, Clutch continuous loop, Literise cordless system, and Motorization systems. Rear fabric air pockets trap air creating an extra layer of insulation for enhanced energy efficiency. Homes stay warmer in winter and cooler in summer, saving on energy costs. Available in a selection of fabrics, the shades stack at the top of the window and have no exposed rear cords for a clean look and enhanced child safety. Ultraglide retractable cord system, Clutch continuous loop, Literise cordless system, and Motorization systems. You can come visit us in our showroom to see these fabulous Vignette products for yourself in person. This is the better and safer way to have the beautiful look of a roman shade in your home. Posted in General on September 4, 2013 by socialmediamanager. Did you know that we sell Justin Camlin Furniture?! We do and we are obsessed with the beautiful designs and colors offered though this line of custom furniture. Justin Camlin offers 28 colored finishes, 2 wood stained finishes, 3 different distress levels, and two tone options available on most pieces. All items are made of solid birch and birch veneers with boxed English dovetail construction. Image via Justin Camlin Come see this headboard in our showroom! Image via Justin Camlin Come see this chair in our showroom! You can view all the finishes here too! Are you obsessed as we are? We have a few pieces in stock in our showroom so come visit us and have a look at the quality for yourself! Posted in General on August 21, 2013 by socialmediamanager. Hunter Douglas Luminette® is the perfect window covering for large windows and patio doors and we offer them at Sew Fine! Luminette® is offered as a privacy sheer and as modern drapes. Luminette® Privacy Sheers offer an array of fashion-forward fabrics and colors that provide precise light control with translucent or room-darkening vane opacity options. Soft face fabric is permanently bonded to fabric vanes, offering full view-through and discreet privacy. Face fabric diffuses sunlight into the room, reducing the need for interior lighting. An innovative twist on tradition, Luminette® Modern Draperies create instant drama in a room. Consistent contoured columns of fabric elegantly span window and door openings using Traditional™ or Ribbon™ Panel design options. Come visit us in our showroom to see the Luminette® and Luminette® Modern Draperies and see for yourself how beautiful your windows and doors can truly be. Posted in General on August 14, 2013 by socialmediamanager. On Wednesdays we are going to feature one of our many products we offer here at, Sew Fine. We only carry products that we truly believe in, and trust, so you can be assured that what you put into your home is the best quality. Silhouette is a blind, shade, and sheer in one. Beautiful fabric vanes are suspended between two sheer panels which diffuse light into the room. You can tilt the vanes to add the privacy you want but still have UV protection from the sheers. The UV protection is not only important to your floors, furniture, and other personal belongings, but also to you. The Silhouette looks great in both streamlined modern or contemporary settings or formal settings when paired with drapery or valances. The optional Lite Rise is available on the Silhouette which allows the vanes to be manually operated without the use of cords. Cord safety is one of Hunter Douglas' concerns to help protect your child or pet and keep them safe. Image via Hunter Douglas. Silhouette Vanes combine beautiful fabric and a sheer. This image shows a silhouette open and closed. The Silhouette is revolutionary in window treatments. What do you think of a 3-in-one window treatment for your home? Let us know in the comment section or on our Facebook page! Stop in to the showroom to see the Silhouette for yourself! Posted in General on July 24, 2013 by socialmediamanager. Showroom Spotlight about products and services we offer. Tips and Tricks for decorating, cleaning, and organizing. Design Ideas like mixing patterns and styling spaces in your home. New and classic design trends. Featured products from Hunter Douglas and more. Holiday Features throughout the year. We love to hear feedback so please leave a comment in the comment section for any questions or comments you might have with design, products, or services that we offer. Thank you for visiting our blog! Posted in General. Tags: decorating, draperies, fine, hunter douglas, interior design, interiors, Sew, windows on July 9, 2013 by socialmediamanager.